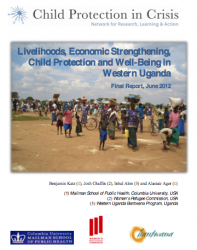 This study addresses the relationship between household livelihoods and children‘s well-being and protection in two districts of Western Uganda supported by the Western Uganda Bantwana Initiative (WUBP). Sampling allowed comparison of 142 households that had received WUBP services (for one or two years) with 104 households that had not yet received services. Across all households both the level of assets owned and the intensity of livelihood strategies were found to be significant predictors of improved physical well-being of children, as well as of improved household provision of children‘s basic needs. However, children‘s psychosocial well-being was not found to be related to household income, assets or intensity of livelihood activities. Households with greater assets reported fewer child protection risks. Findings suggest not only the value of economic strengthening activities to support the well- being of children, but also the potential importance of psychosocial support to households in complementing such provision.